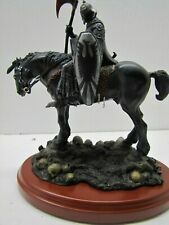 Frank Frazetta Death Dealer statue is 8" tall and is finely detailed hand painted. We at Quarantine Studio felt it fitting that the only thing that could slow the Death Dealer would be the passing of his creator. Frank Frazetta has influenced artists and thrilled fans for decades. Grand master fantasy artist Frank Frazetta’s most famous work is Death Dealer. He painted several versions of this brooding warrior, and we have translated the third of these into a detailed sculpture that captures the mood and colors of the painting. Death Dealer Miniature Statue by Dark Horse. There was an edition of 5000, of which this is # 2648.
death dealer 3 statue, blood on the axe version. Purchased in 2004 and kept in its original box outside of being photographed a couple of times. The statue measures 14 inches tall and its base 9x6. The statue is in excellent condition. This statue captures the Death Dealer as he appeared in the first painting by Frazetta. 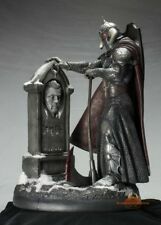 Fully painted, cold cast statue. Statue includes burnished chains and sits atop a hardwood base. NEVER DISPLAYED. By Frank Frazetta & Randy Bowen. It was dusty, we cleaned it to the best of our abilities. The Statue itself is in Fine /Excellent Condition. Bowen Designs. 1997 Fully Painted Cold Cast Statue. Dark Horse Comics. In very good condition. Made of PVC vinyl, not poseable. This is a n excellent find for any collector or collection! We take great care and pride in our collection and hope to share it with other collectors and enthusiasts. This magnificent sculpture is a tribute piece to the master of fantasy art, Frank Frazetta.”. NOTE: We are contracted by Frazetta Jr. –Frank Frazetta Jr. Unpainted polystone resin kit, assembly and painting required. Death Dealer 4 by Frank Frazetta statue. # 42 of 1000. They made 1000 regular ones on a round wooden base & only 100 on a square wooden base signed by Frank. FACTORY NEW★FRANK FRAZETTA: PRINCESS STATUE 1996★By Clayburn Moore. Sculptured by: Clayburn Moore. Based on designs by: Frank Frazetta. Princess Statue. Released by: Moore Creations. WILL NOT CHANGE THE PRICE OF ANY ITEM(S) ON THE CUSTOM FORM. 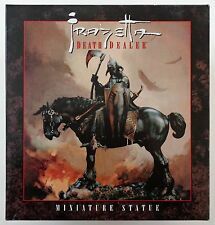 Death Dealer 4 Signed by Frank Frazetta statue. # 5 of 100. They made 1000 regular ones on a round wooden base & only 100 on a square wooden base signed by Frank. Frank Franzetta Princess of Mars Statue by Clayburn Moore 1996. 2807/4000. This piece captures the elegance, voluptuousness and enchantment of the female form, which are hallmarks of the Frazetta style. The statues comes on a wooden base. This gorgeous rendition of Dejah Thoris is hand painted. She is in mint condition and comes with its original box. I checked and didn't see any broken bits or missing pieces. July 23, 2008. Publication Date ★Out for big savings?. 12 1/4" tall, 12 1/8" wide, 11 7/8" deep, Limited to 2000 units for worldwide distribution. The series sold out as fast as Frazetta’s fans could buy them, and rapidly increased in value for any collector fortunate enough to get his or her hands on one. Death Dealer III, is being refinished in a limited-edition Faux Bronze. Standing atop a barren landscape littered with trophies of his conquests, the Death Dealer awaits. Quarantine Studio is proud to announce the release of our Limited Edition Death Dealer collectible statue in aFaux Bronze Finish. Standing atop a barren landscape littered with skulls, the Death Dealer statue wields his massive weapon, eyes glowing red with visions of blood. Death Dealer Statue Frazetta NEW In Box NEVER Opened. I bought this at the Frazetta Museum in PA. Artist proof version. The detail is excellent and the paint job is one-of-a-kind. I spent weeks assembling and painting this kit. There are no seams. I am a perfectionist and take great pride in my work. I honestly feel you will not find a better looking Death Dealer anywhere.